The Beatles community gathered recently for the anniversary of Cirque du Soleil's LOVE show in Las Vegas. 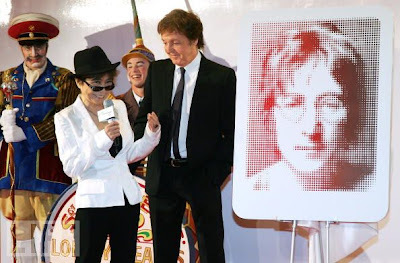 The event prompted a new remix for Yoko Ono that is a meditation on friends and lovers everywhere, and is presented today in honor of Paul McCartney's birthday. On the heels of his winning remix and experimental film for Yoko Ono, Spy Vibe creator Jason Whiton composed a new sound collage called "Love Piece" that is a mantra in honor of reunions and reconciliation. Sound file via Jason Whiton on SoundCloud. Image of 2007 LOVE meeting between McCartney and Ono from Life Magazine. See recent Spy Vibe posts about experimental sounds and musique concrete in the 1960s and beyond, including news of Paul McCartney's plans to make a new experimental project with his original Tomorrow Never Knows machines here and a documentary about the BBC Radiophonic Workshop and Doctor Who here.